Charles was born in Michigan to James Herbert Ferris and Daisy Ruth Thackwell. 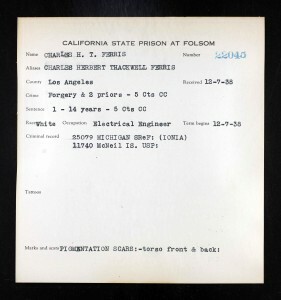 By 1940, at the age of 27, he had served prison time in Michigan, at the Federal pen in McNeil Island, Washington, and in California’s famous Folsom Prison. His Federal sentence was three years, for forgery. Oct. 1935 to Sept. 1938. His term in Folsom began Dec. 7, 1938. 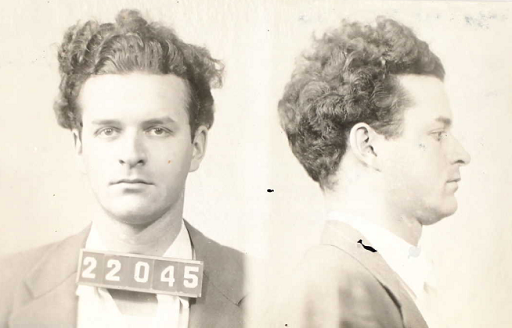 He was sentenced in Los Angeles County for forgery with two priors, 5 CC (whatever that means). He was to serve one to 12 years. 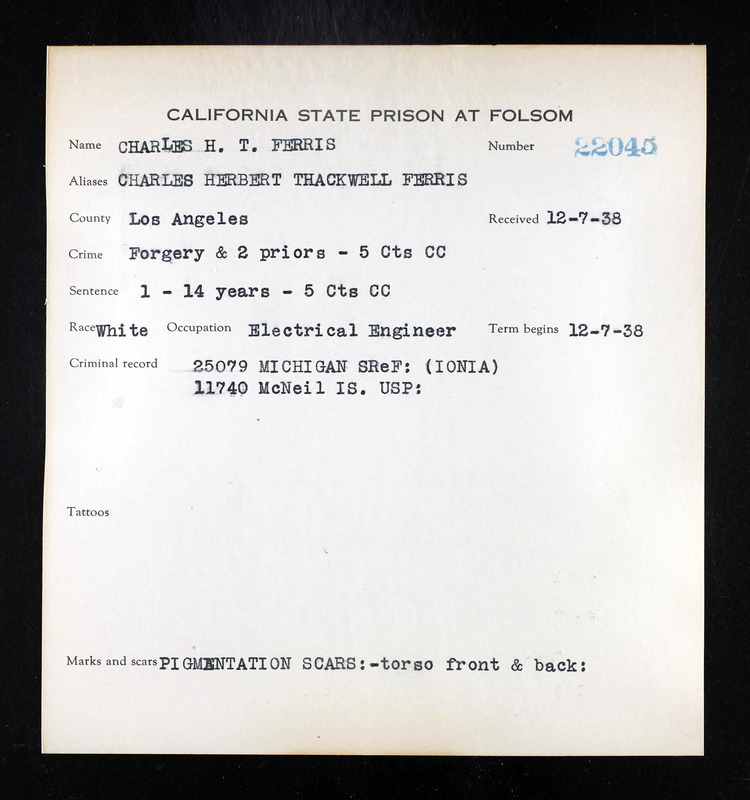 Update: a kind Los Angeles County assistant district attorney has suggested that the mystery means that Charles was sentenced for five counts of forgery with the sentences to be served concurrently. 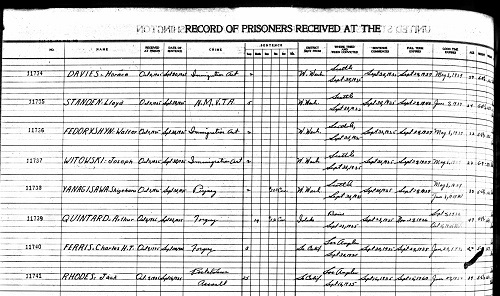 I have not yet located the prison record in Michigan. After prison, he married Bethel Kofoed in 1942, in Tacoma, Washington. He remarried after her death in 1987. Sometime along the way, he seems to have begun using his mother’s maiden name. Later facts about Charles are found listed under Charles Herbert Thackwell, Charles Herbert Ferris-Thackwell, etc. Update: Both Bethel and Charles’s second wife were heavily involved in the church activities of the Assemblies of God. 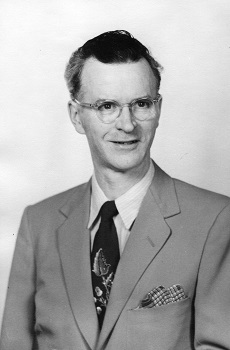 It seems that around the time that Charles married Bethel in 1942, he changed. Indeed, he may even have been ordained a minister in the Assemblies. The couple had one son and three daughters, who all used the Thackwell surname. 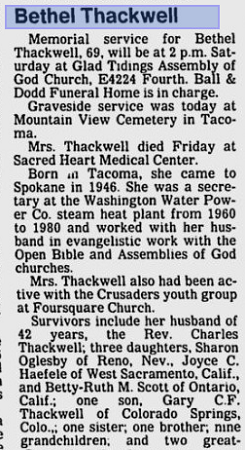 The son, notably, is Gary C F Thackwell. That may be Gary Charles Ferris Thackwell. He lived most of his life in Washington State, where he worked as a draftsman and was chief building inspector for the county of Spokane. He was a retired Evangelist Missionary, having done work in the United States, Mexico and the Soviet Union.